One of this summer's goals is to have the barn completely sheathed before the end of October when the weather will start to really turn. 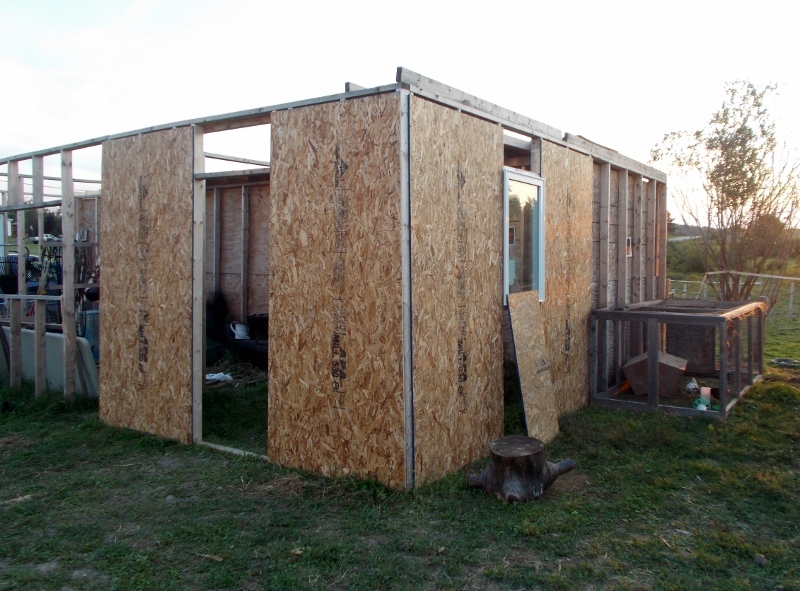 So far, the three 10x10 stalls for our goats and horse have been framed, the interior walls sheathed, and almost completely roofed. The front three 10x10 stalls earmarked for our milk room, birthing/isolation stalls, and tack room have been framed. The milk room has been almost completely sheathed outside. The current hold up is that one corner of our would be barn rests in an 8 inch decline. We are at a standstill for sheathing until a foundation for that corner can be poured. It is not a huge job in terms of time or effort. In terms of money, it is more than we have to spend today. 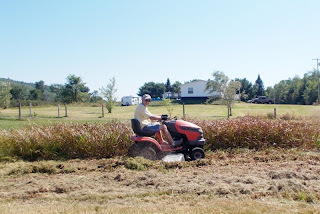 We are on our way and there will soon be a post titled Barn Building: part 3. 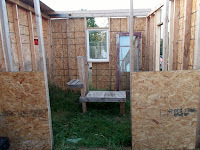 Until then, you can see from these pictures, our progress from last week. We sheathed the exterior of the milk room, framed out the door way and installed the window where it is going to permanently live. Now, to mow the grass inside the building. 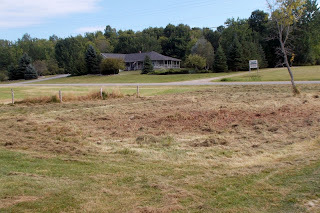 Another project which was tackled last weekend, was the taming of our front yard. I think I have posted about the yard in front of our house that is determined to be 3-6 inches of water most of the year instead of a nice lawn area. It can't be mowed down because of how wet and unnavigable it is, so we have allowed it to pretend to be a pond until a true farm pond could be dug in that spot. And, I have resigned myself to occasionally sigh or glare at it when I drive into the yard each day. This summer has given us a bit of a break because of its relatively dry state. 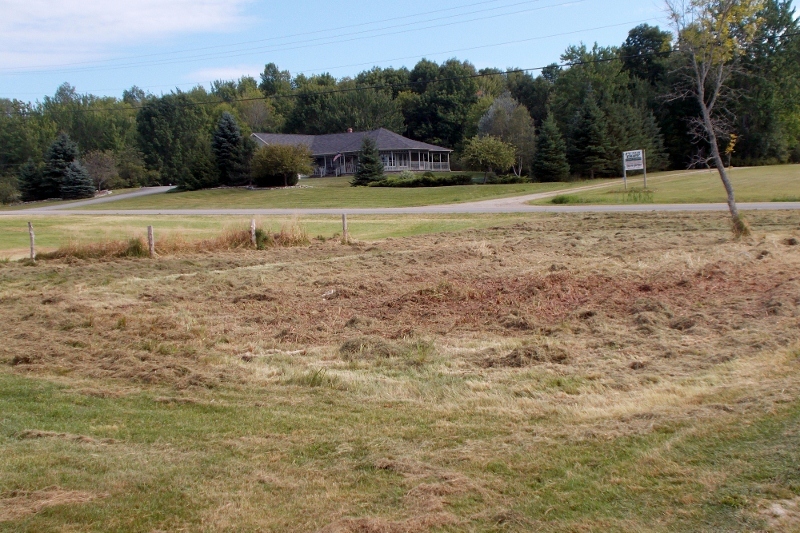 With the help of Sean and Daddy Dale- since I was disinclined to attempt it myself due to its infestation with garden spiders- the spot has been mowed flat. It still needs a good raking and another go over with our new rider, but there is a glimmer of hope that a pond will be dug this year. I can already envision happy ducks and geese playing in it! Three more chicks hatched from the four eggs in the nesting box outside. Two of them came on Thursday morning. One of these was a full blooded Americauna and the other we are hopeful will be an "Easter egger" cross. (We know the father is Americauna, but the mother is either a Buff Orpington or Rhode Island Red. We won't know if it carries the "blue egg" gene until it begins to lay its eggs in 5 months. We hope it does!) They have already moved into the brooder in the house and are keeping our other 2 chicks fine company. We had another egg hatch on Friday while we were at work. We found the chick when we got home from work, but sadly, it had not survived. There is one egg left in the nest box, which will be candled this morning to check for signs of life. 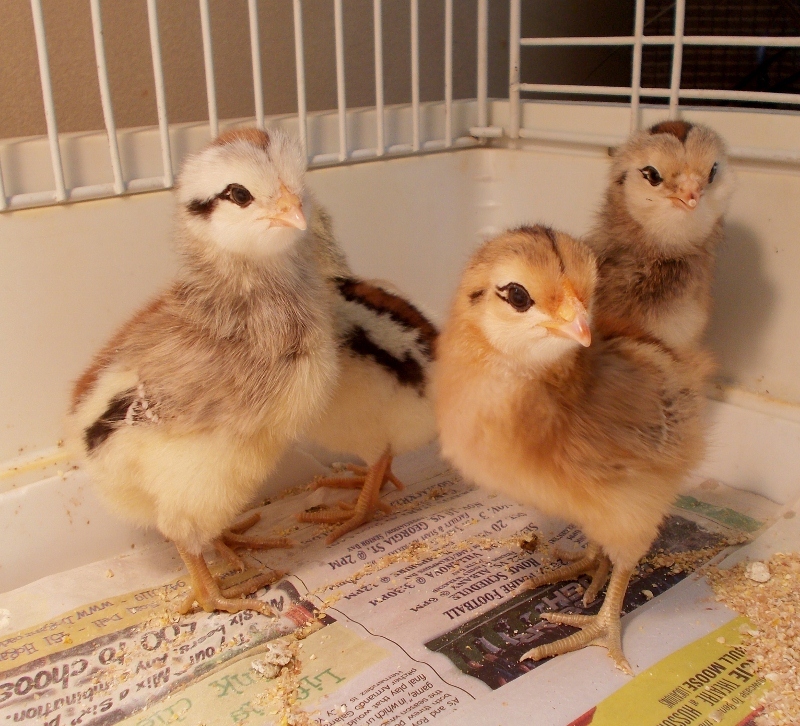 If it hatches and lives, our hatch rate for the broodies is 85%. If not, our hatch rate was 80%. Last night, Sean and I harvested more tomatoes, cucumbers, and peppers. With the weather beginning to change, our tomatoes are all ripening up and looking delicious. We grabbed a basket full of goodness while we checked on all the pens before settling in for the night. After a family dinner at home (of fried chicken, fresh corn on the cob, loaded smashed potatoes, and crescent rolls with Kristen, Meaghan, and their Dad, Chris) and seeing the girls off for their weekly sleep-over, Sean and I worked together to can 3 more jars of garlic dill pickles, and 9 pints of salsa. I love working together on these projects. 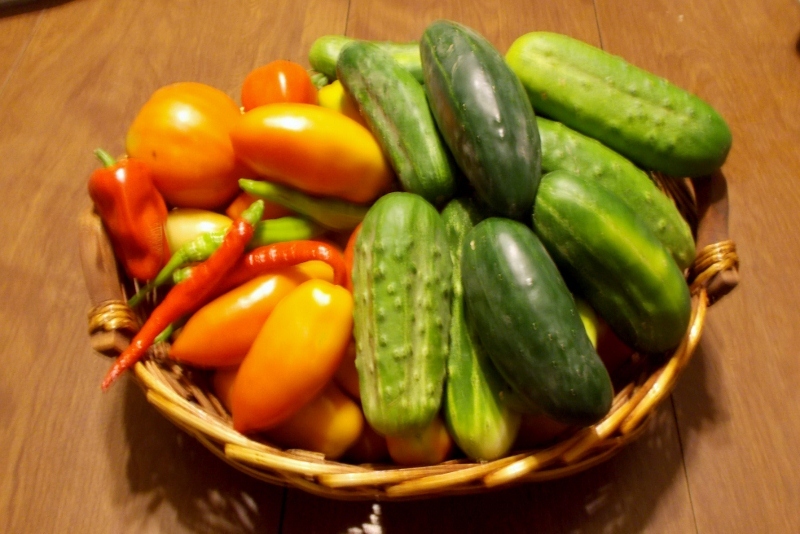 So far this year, we have canned 19 pints of salsa, 12 jars of dilly beans, and 4 quarts and 4 pints of garlic dill pickles. It is not a lot, but it is a great start, I think! Look at this guy! We found two of these on the cherry tomato plants in our back yard. They are HUGE, about 4-5 inches long and as thick as one of my fingers! They had eaten nearly all the leaves off the plant before we found them. Sean removed them after snapping this picture and rehomed them to the field where they would do no harm. 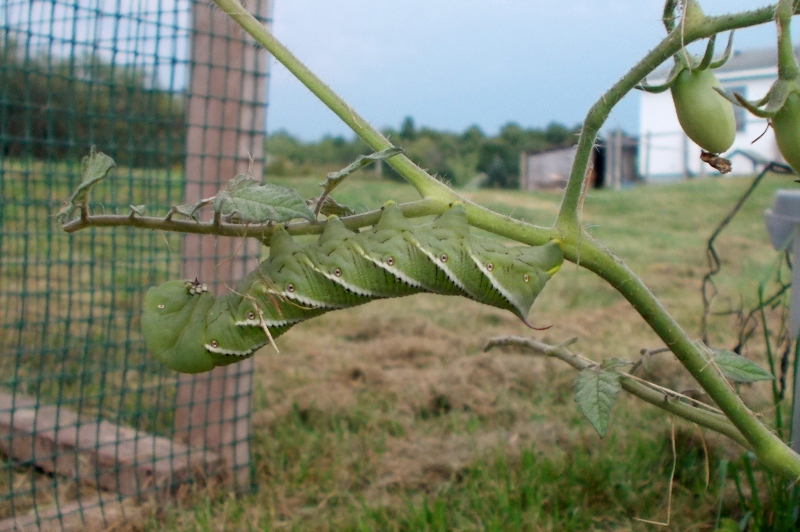 Curious to what they could be, we looked on line and think they might be Luna Moth caterpillars based on ---> this picture we found online. Looks similar to me. We are glad you visited today. Come again, soon! 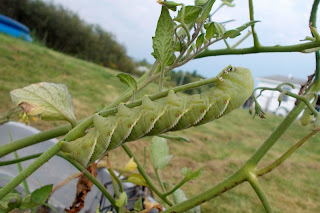 Thanks to Tammy from Our Neck of the Woods for identifying this pest as a Tomato Hornworm. Are we glad to have taken them off the tomato plants! These beasties are capable of destroying our harvest. You can read about them on her blog linked above. More babies! I will let you know about the soap when it arrives. I made the apple pie from your canned filling and it was a big hit! So glad things are coming together on the farm. 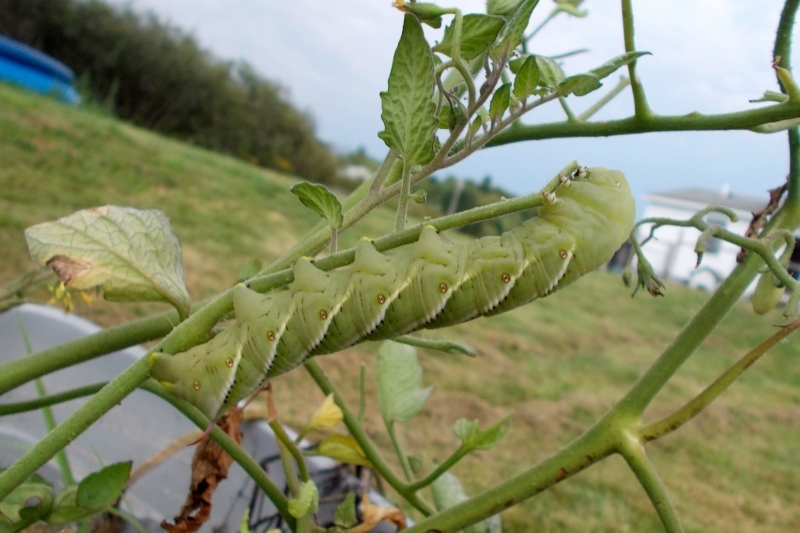 Oh my gosh, we really are birds of a feather - we saw those same exact caterpillars on our cherry tomato plants over the weekend! They really gave me the creeps. I was going to do a post on them today if I figured out what they were, so thanks for doing part of the work for me haha! Blog Hop #4~ How Fun! Oh, the Glamorous Life of a Farm Girl!